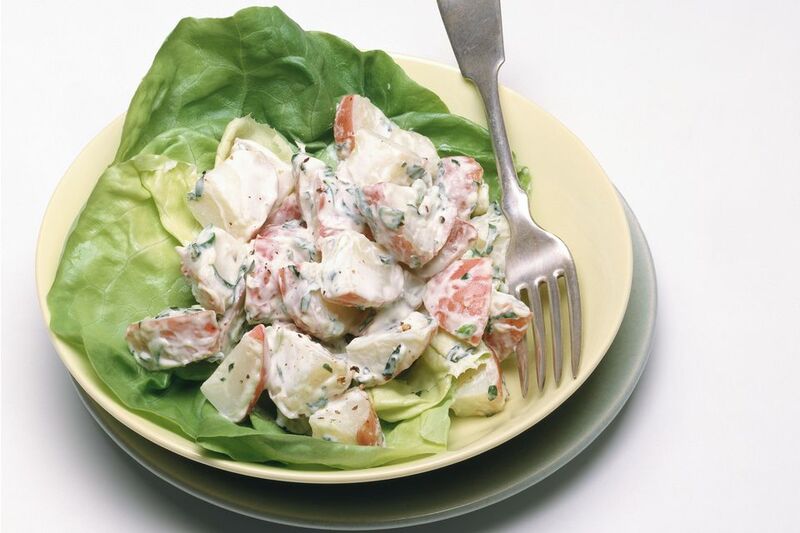 This classic red potato salad is tossed with a flavorful seasoned mayonnaise dressing. A small amount of vinegar and sugar flavor the dressing. Feel free to add diced cucumbers or garnish with sliced cucumbers, bell pepper rings, and sliced tomatoes. Make this potato salad for a cookout or summer gathering. Place whole unpeeled potatoes in a large saucepan or Dutch oven. Cover with salted water. Cover the pan and bring to a boil. Reduce heat to low and simmer for 20 to 30 minutes, or until potatoes can be pierced easily with a fork. Drain and let cool until easy to handle. Cut the cooled unpeeled potatoes into halves or quarters, depending on​ the size of potatoes. Chunks should be no larger than 1 inch. Foodborne bacteria can contaminate food between the temperatures of 40 F and 140 F. Keep salads refrigerated or in a cooler at or below 40 F until serving time, and return leftovers to the refrigerator within 2 hours — 1 hour if the serving temperature is 90 F or above.